Sanpada: In a unique surgery, a 70-years-old patient suffering from a curved spine problem has undergone a successful cataract operation in a city hospital. The surgery was considered a challenge as the patient could not lie down on the operating table owing to a spine condition, which made it impossible for him to lie down flat on his back. Operating upon Vashi resident Gangji Nagda was a unique challenge for the city’s top eye specialists. Nagda suffers from Kypho-scoliosis, a condition which causes his chest and neck spine to be curved abnormally. In his case, the condition is so severe, that his upper spine is permanently slumped forward in the shape of the letter ‘C’. “I went to see a reputed Cataract Surgeon in the city as age had caught up with my eyesight. However, many surgeons were flummoxed as to how they would operate on a person whose head could not even touch the operating table,” said Gangji. The surgery requires the patient to lie flat on the table so that the microscope and other apparatus be focussed over the patients’ eyes. “I was exasperated when my son-in-law brought me to Advanced Eye Hospital and Institute (AEHI) in Sanpada. All the pre-surgery tests and check-ups were completed and to my surprise, the doctors scheduled the surgery,” he added. “We lowered his head at an angle. 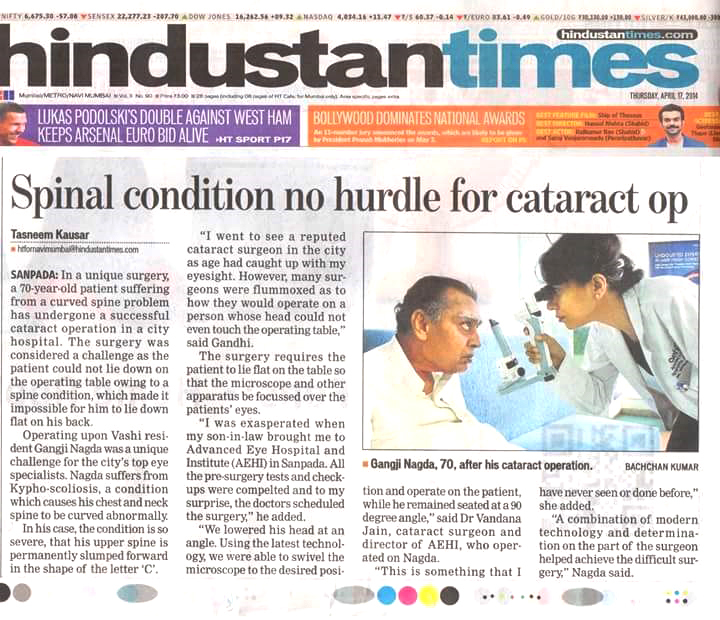 Using the latest technology, we were able to swivel the microscope to the desired position and operate on the patient while remaining seated at a 90 degree angle,” said Dr Vandana Jain, cataract surgeon and director of AEHI, who operated on Nagda. “This is something that I have never seen or done before,” she added. “A combination of modern technology and determination on the part of the surgeon helped achieved the difficult surgery,” Nagda said.